Arizona authorities are bracing for an anti-Islam biker rally scheduled outside a Phoenix mosque. John Ritzheimer, an ex-Marine organizing the event called for participants to come armed and draw cartoons of Prophet Mohammed. Ritzheimer says he is targeting the Islamic Community Center because the two Islamic State (IS, formerly ISIS/ISIL) sympathizers who attacked a Texas event featuring caricatures of Mohammed used to attend the mosque. “This is in response to the recent attack in Texas where two armed terrorist[s], with ties to ISIS, attempted jihad. Everyone is encouraged to bring American flags and any message that you would like to send to the known acquaintances of the two gunmen. 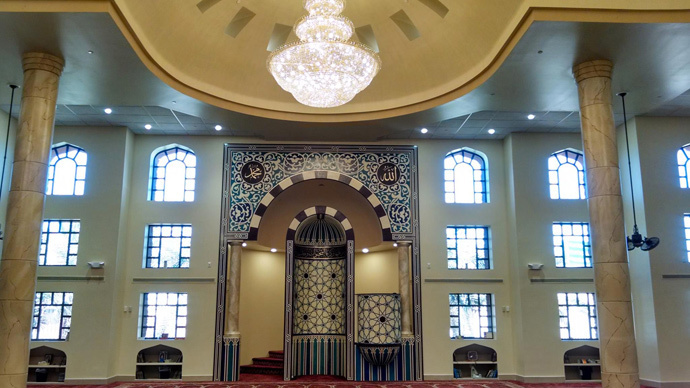 This Islamic Community Center is a known place that the two terrorist[s] frequented,” says the Facebook invitation to the event. By Thursday afternoon, fewer than 300 out of nearly 3,000 people invited had indicated they might show up. The two Phoenix residents, Elton Simpson and Nadir Soofi, reportedly attended the mosque until 2010. On May 3, they attacked the “Mohammad Art Exhibit and Contest” in Garland, Texas, organized by the controversial group American Freedom Defense Initiative (AFDI). Simpson and Soofi were killed by event security, while one guard was injured in the shoot-out. Ritzheimer described himself as an outspoken, politically correct Marine. One of the profile photos on his Facebook page shows him waving an American flag and wearing a shirt with an explicit anti-Islamic inscription. Usama Shami, the current president of the Islamic Community Center, told KPNX he will encourage his members to not engage the bikers. “Everybody has a right to be a bigot. Everybody has a right to be a racist. Everybody has a right to be an idiot,” Shami told KPNX. “They're not looking for an intellectual conversation. They're looking to stir up controversy and we're not going to be a part of it." Somewhere in Arizona: "Let's combine the two best things that've happened in Texas this year!" "Yeah! Armed bikers and Muhammad cartoons!" The Previous “Freedom of Speech Rally” on May 17 drew few people and little attention. Phoenix Police declined to comment about any security measures they may be planning for the event.